Posted on January 19, 2015 by Nida S.
I was in Lahore last November. If I close my eyes now to relive some of the city’s glory, I wouldn’t know where to start. What do I remember? What do I smell? What do I taste? For me, as an immigrant, that is probably the single most difficult question. ‘What do you miss the most back home?’ How do you answer that? Do you dig up memories only you can make sense of, or do you cough up the obvious; ‘Oh, I miss friends and family.’ Of Course you miss the important human connections in your life. But what else do you miss? I remember everything, but a part of me feels that I keep missing out on something. I smell life. I taste home. And I miss absolutely freaking everything! Is it the scorching, sun-lit roads in June with gushes of warm air harassing anyone who crosses its paths? Or the comforting chill of a December evening as streets line up with stalls carrying roasted corn, peanuts and chicken corn soup? Or how life in Lahore is lived simply yet luxuriously. In the tired and content eyes of men sitting on the roadside, slurping chai and acing all possible realms of non-work? Or hard workers who race home in their motorcycles, bringing the day’s limited grocery (eggs and oranges) to eager wives. Their shalwars, filled up like fabric balloons with polluted air. Or the women, with threatening and urgent looks as they enter the tight bazaars, clinging to their dupattas(scarves) and holding non-recyclable shopping bags. Or the lucky children sitting in cars, gawking at other, not-so-lucky children their age, clambering for spare change as they wipe away grime on windshields. Or Lahore’s inexplicable love for food as restaurants are born in succession like a rapid breeding experiment. Or the dirty Lahori sky, once dressed in exuberant kites, but now hosting a sea of exhausted cries. Is it the loud Bollywood music pumping from a local CD shop in a busy supermarket? The music comes to an abrupt pause as the shop worker presses the stop button when a nearby Mosque calls Azaan (signalling prayer time). Or how the city sings; in between blaring honks on the road, drivers shouting in their cell phones, rickshaws gurgling and choking, shopkeepers and women haggling, children screaming with laughter, and sizzling of the fried Pakoras. The city is never quiet. Be it hot or cold. Amid a local festival or a suicidal bomb blast. The city doesn’t cry for long either. Don’t be surprised when you catch its people smiling as the day ends. Or cracking up at a random joke on Politics or the economy; drowning out the day’s grind that doesn’t include electricity, gas, or Petrol. In my head, everything is just more poetic and alive when I think of Lahore. How do I pay homage to a city that holds almost half my life’s soul. It guards my memories like a welcoming canvas; letting novice painters bleed; unjudged and unafraid. My city; where I grew up a little, laughed and loved a lot, made sense a little and messed up a lot. So the question comes again. What comes to mind as I close my eyes? Is it my high school, where I sweated off under a ceiling fan, writing away for a good grade; in all my awkwardness, in all my naivety? Is it my college, where I only survived because of close friends. And our sporadic adventures as we skipped class to gorge down freshly made brownies, soup and samosas on faint and foggy winter mornings? Or is it my university, my home away from home; tucked between the greenest suburbs of Lahore? An overwhelming world of its own that swooned and shocked me for a whole four years. Is it the many homes I lived in? The home I stepped out of my teens in. The home where I cried for my brother when he went abroad to study. Is it my first job, where the pay was peanuts, but I cherished every cent? Or my second job, where I met my husband. The home I said goodbye to my parents in as I got married. The home I became a mother in and grew to love my new family like my own. Or when my son walked his first steps. Or celebrated with us every time the power came back on by clapping and speaking his first few words – ‘Biji’ (Bijli as in electricity). Is it the hospital where I grew dizzy with joy when the doctor told me I was pregnant with a daughter. Or maybe it’s a combination of these past 15 years that tickle me with nostalgia. And what about the carefree soul of the city? How has it survived so long? Before me, before my forefathers and before their’s? During the rule of the Mughals with their fortress situated in the heart of the city. During the bloody India-Pakistan partition, when thousands of people migrated from India and some fortunate ones landed in their new home, Lahore. A home where blood is always washed away and buried under lights, love, colour and life. It’s hard to see where the city stands now, when it has already seen the best and the worst. Or maybe both are still to be seen. Lahore, until a couple of years ago, I watched your joy and struggle with choked breath. I always tried not to look away. But you know what? One day, I did. That day I did a lot of things to you. I left you on your own. I gave up a little on you. I cried for you. I hoped and prayed for you. But I kept you in my heart. Like a crumpled message trapped in a bottle floating in an endless sea; never breaking, never escaping. And that’s why I keep coming back to you. I owe you that. I owe myself that. This smells so like home, even though I’ve never been to Lahore unfortunately. But I can feel the ache inside all of me for Karachi, and Pakistan. Beautifully put. “Jine Lahore Nahin wekhya O jamiya nahin.” But I won’t. No wait, I just did, didn’t I!? On a serious note, I love Karachi too. Every city has its own story. But you must visit Lahore some day:). Thanks for reading! Since I had the pleasure of gaining admission to a college in Lahore, I’ve fallen in love with the place increasingly. Just today I was wandering in Anarkali, and my thoughts were similar to yours! Lahore is an old man with a hookah, a teenager one-wheeling along the canal on his bike, a woman who’s face tells the tales of time, all in one. 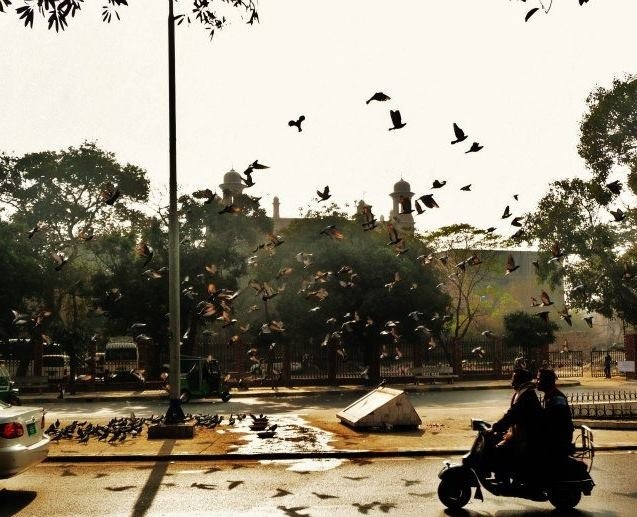 “Lahore is an old man with a Hookah, a teenager one-wheeling across the canal…”. LOVED this! I should ask my Pakistani fellow writers like you to pitch in and describe Lahore, or any other city they love in different ways. Hmmmmmm. Thanks for getting the wheels in my head turning:). Beautiful tribute. Makes me want to visit. If you ever do get the chance, DO VISIT :)!